US Attorney Andrew Lelling speaks to reporters at Moakley Courthouse. 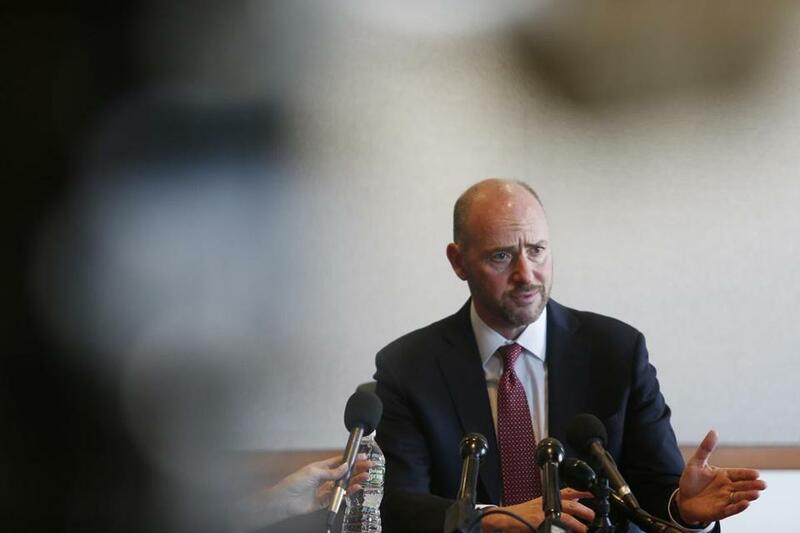 MS-13, the deadly international gang the Trump administration has held up as justification for its hard-line stance on illegal immigration, has been effectively neutralized in the Boston area, the state’s top federal prosecutor said Wednesday. Lelling’s comments came during a wide-ranging conversation that touched on topics from marijuana and immigration to a recent Globe report about a federal probe into a Newton judge and other court officials who may have helped an unauthorized immigrant elude federal immigration authorities. Lelling said he could not confirm or deny the investigation, which the Globe has reported is focusing on whether a Dominican man was allowed to flee out a side door following his arraignment. Officers from the Immigration and Customs Enforcement were in the courthouse waiting to detain him. Lelling expressed doubt about reports that ICE has been targeting unauthorized immigrants at courthouses and said the agency follows strict guidelines about when to enter state courts. “My understanding is that it’s not something that happens routinely,” he said. But Iván Espinoza-Madrigal, executive director for the Lawyers’ Committee for Civil Rights and Economic Justice in Boston, said that over the past year, his organization has documented more than 100 instances of immigrants being apprehended in two dozen courts around the state. During the interview, Lelling reiterated his commitment to focusing prosecutions on immigrants who have reentered the country illegally and have also committed other crimes. Over the past year, dozens of men identified as MS-13 gang members have been convicted for crimes ranging from racketeering to murder. Lelling’s comments about MS-13 came in response to a question about the gang database run by the Boston Police Department, the Boston Police Regional Intelligence Center. The center gathers information about people believed to be involved with gangs and shares it with other agencies. The database, known as the BRIC, has become the subject of charged debate among law enforcement and civil libertarians, who have questioned the accuracy of the intelligence and expressed concerns that minorities, particularly Central American men, are being profiled as gang members, a designation that can lead to their deportation. Lelling defended the accuracy of gang intelligence collected by law enforcement, pointing to four federal trials over the past year that led to convictions of men accused of perpetrating crimes on behalf of MS-13. “That’s the best confirmation I can think of that these individuals were in fact in MS-13 and participating in illegal activities,” Lelling said. He called himself a “fan of the BRIC” and said his office often relies on information from the database, which is then verified by other intelligence. “The BRIC’s track record is outstanding,” he said. Lelling acknowledged that eradicating MS-13 could lead to the ascension of its rivals, such as the 18th Street gang. “All that means is that 18th Street or other large gangs that were rivals of MS-13 are now our next priority,” he said. Jake Wark, a spokesman for Suffolk District Attorney John Pappas, confirmed that the federal convictions, which followed joint investigations and arrests of gang members with local police agencies, had struck a major blow against the gang’s operations. He said law enforcement, schools, and social services need to work with younger members of MS-13 who remain on the streets. “There is a golden opportunity to divert younger members from following in the older gang members’ footsteps,” Wark said. Lelling was also asked about letters he recently sent doctors, warning them to be more careful about prescribing opioids to patients. Lelling declined to say how many letters he sent but said they were directed at doctors whose patients had died of an overdose within 60 days of being prescribed painkillers. The warnings did not involve cases where the patients were terminally ill or in hospice care. On Tuesday, state Attorney General Maura Healey announced involuntary manslaughter charges against a doctor whose patient died in 2016 of an opioid overdose. Lelling said prosecutions are a “tool” his office could use but stressed that the letters should not be seen as a precursor to federal indictments. Maria Cramer can be reached at mcramer@globe.com. Follow her on Twitter @tglobemcramer.